A glaucous (blue-green) erect single to several stemmed annual with yellow sap, reproducing only by seed and with a central taproot. It grows from 60 to 120cm in height. 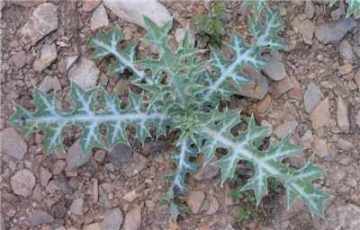 It has leafy stems that grow up to 60cm, with prickly lobed leaves. The flowers are showy and have a dark red 3 to 6 lobed stigma (glandular region at the tip of the style). Commonly found as a weed of roadsides, mining dumps, rabbit warrens, recently cultivated paddocks, waste places, and over grazed pastures. It often occurs as dense stands in sandy stream beds and alluvial flats associated with intermittent inland streams. Stems are bluish-green, pithy, smooth or slightly pubescent (covered with short hairs). 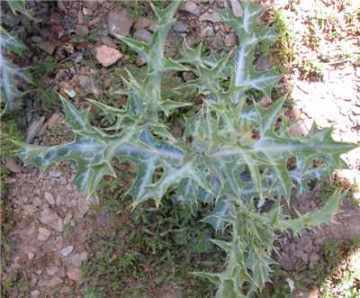 The stems grow 30 to 100cm high, with scattered stiff yellow prickles. The seed leaves are stalkless, narrow lance shaped, curved and whitish-turquoise with white veins and are about 26mm long by 1.3mm wide at the first true leaf stage. The first true leaf is narrow with three triangular, pointed lobes at the tip and a tapering base. The second true leaf is also narrow but is deeply lobed. The leaves are bluish-green and alternate. 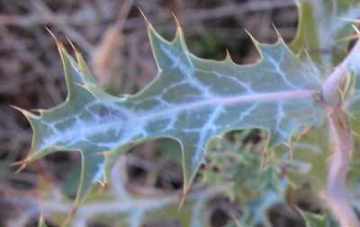 The basal leaves are slightly stalked and crowded into a dense rosette (a cluster of leaves at the base of a plant often lying flat against the ground). The upper leaves are sessile (without a stalk) and clasping the stem, the shape being variable. The leaves are generally 6 to 20cm long, 3 to 8cm wide, deeply divided into 7 to 11 coarse irregular lobes, covered with a powdery bloom, the upper surface of the leaf has paler stripes along the veins. 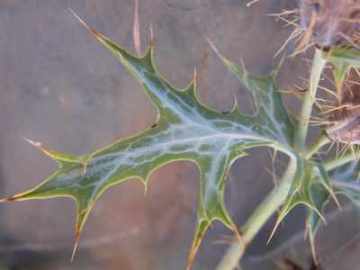 The margin (edge) of the leaf has wavy prickles at the tips of the lobes as well as scattered on the underside of the leaf. Flowers are creamy white to yellow, on a short stalk or sessile (without a stalk) at the ends of branches, and are 3 to 6cm wide in diameter. There are 3 hood-like sepals that are sparsely prickled with a large spine just below the apex. The sepals are shed as the flower opens. There are 6 delicate deciduous petals that are 2.5 to 3cm long and 1.4 to 4cm wide. There are numerous stamens. The sepals are shed as the flower opens. The fruit is a prickly ellipsoid capsule that is 2.5cm to 5cm long and 2cm in diameter, crowned with a persistent style and narrowed at both ends and widest below the middle. When the fruit is ripe it opens from the apex downwards, splitting away from the style with ribs attached to the stigma and so resembling the ribs of an umbrella. The seeds are numerous dark brown or black and globular and are about 1.5mm in diameter. Argemone ochroleuca Sweet subsp. 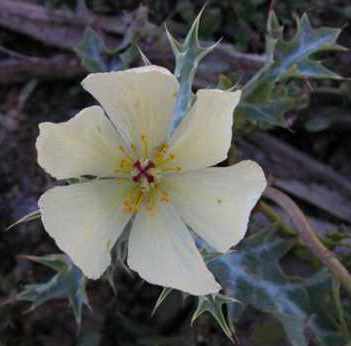 ochroleuca (Mexican poppy) is widespread throughout NSW, it has cream to pale yellow petals; seeds approximately 1.5mm diameter and a capsule with numerous spines. These features distinguish it from the similar Argemone subfusiformis Ownbey subsp. subfusiformis (American poppy) which has butter-yellow petals; seeds approximately 2mm diameter and a capsule with fewer and larger spines. This plant is found on the north coast and northern and central slopes of NSW.